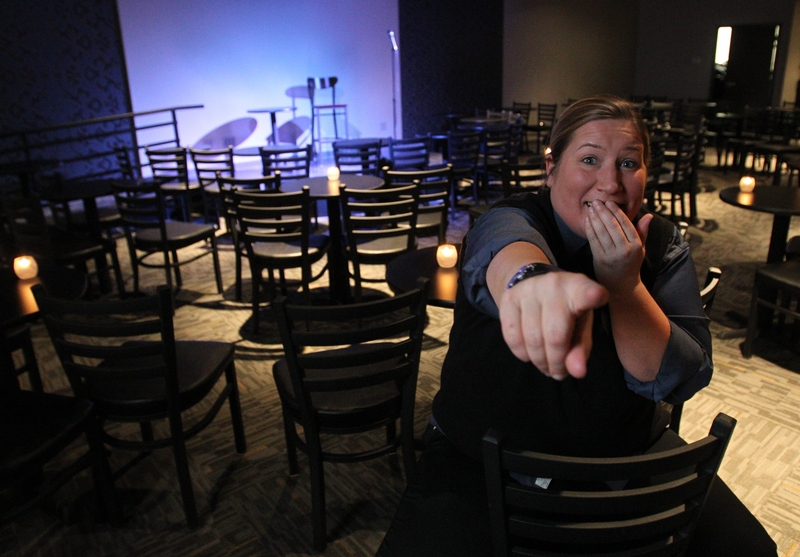 “I’ve never understood why there hasn’t been a bigger comedy scene in Buffalo,” says Kristen Becker, general manager of the new Helium Comedy Club. Kristen Becker, the reigning leader of stand-up comedy in Buffalo, who has spent the last seven years effectively building, managing and honing the city’s comedy scene, admits that she never really wanted to own or run a comedy club. The stigma attached to the managerial role has always been a “those who can’t do, teach” sort of position, says Becker. Except Becker’s been doing quite a bit, it turns out. When not running her own Doin’ Time stand-up production company, or headlining and managing the popular Dykes of Hazard lesbian comedy tour, Becker is busy opening for prominent musicians and comedians in and around Buffalo, her home base of operations. It’s not exactly a “can’t do” attitude that’s kept her back. Her dream, she’s happy to say, didn’t come true. Becker is general manager and public face for the new Helium Comedy Club, located in the former W.J. Morrissey’s and Benchwarmers in the Cobblestone district. The space includes a 260-seat theater, built for both stand-up and presentation space (think corporate meetings), and Elements, a full-service bar and restaurant. In its first two months of regular operation, the club has hosted national headliners D.L. Hughley, Tammy Pescatelli, Rob Schneider, Brian Posehn and Birbiglia. And people are coming. During Schneider’s Thursday night opening performance last month, the first of five over three nights, an excited and well-appointed crowd of fans were ready for the former “Saturday Night Live” regular. Between laughs about bodily fluids and annoying in-laws, Buffalo comedy fans were offered a more tailored room than perhaps they’ve been used to. Marc Grossman, the Philadelphia-based owner of Helium comedy clubs in Philly and Portland, Ore., notes this confidence as the potential he saw in the Buffalo comedy market. When Grossman approached Becker about the prospect of moving into Buffalo, opportunities lined up at the door. Originally, Grossman was interested in implementing his ticketing system, a sort of midscale Ticketmaster for venues like Nietzsche’s, where Becker had been holding down a weekly open mic night for seven years. But when Becker, ever the marketer, realized the likely potential of a Helium in Buffalo, attitudes changed. Suddenly, the chance to upgrade the organic, scrappy, homespun stand-up scene into a grown-up, viable platform, would beckon Becker. Before October, if you walked into Nietzsche’s on Allen Street on a Tuesday night, you would notice a small but dedicated gathering. In the club’s back room were comedians attempting to land with precision their stories of shame, jokes about embarrassment and admissions of guilt – such is the medium’s trope. When not on stage emceeing the week’s lineup of blind novices and warm amateurs, Becker’s sudden, warm, yet alarming laugh could be heard from the darkness; the spontaneous reaction that would erupt in both joy and subconscious approval. Her weekly open-mic night, that hallowed community watering hole where every young stand-up learns to swim, was a popular one. The Doin’ Time presenting brand became synonymous with Becker, this weekly incubator, and the comedy community in general. It is a community that Becker says Buffalo needs. Becker’s linking stand-up comedy to legit theater is not a stretch. For every political stand-up positing public criticism (George Carlin, Jon Stewart), there’s a character-driven performance artist (Andy Kaufman, Larry the Cable Guy) making similar waves, with different textures. But in a city like Buffalo, whose own stage heritage dates back to vaudeville, where comedy was artistically regarded in the same vein as singing, acting and dancing (of the “nightclub” variety, no less), it echoes an industry model that’s hard to come by these days. Stand-up is perhaps the last remaining circuit in show business. “In order to work as a comic, you have to move around. The one main difference is if you’re working the club circuit, you’re working Thursday, Friday, Saturday at the same place, as opposed to a musician who is going to do a Friday here and a Saturday somewhere else,” says Becker. This means comedians can’t break ground without moving around. If Buffalo is quick to defend its arts scene, it is also slow to export it. There’s a sense among other mediums and public minds that the city must protect what it has, controlling its quality but also its preciousness. Becker doesn’t buy it. “I’m all about exporting. You have to have a national presence, if not a global presence, in this point in time in the world,” says Becker. It helps the scene but it also helps the individual comedian. “You’ve gotta know every stage out there. You just get different as a performer when you’re out of your comfort zone. And that’s true everywhere. So if all you’ve done is played Nietzsche’s for five years, I could send you to Erie, but you’re gonna bomb because you’ve only played Nietzsche’s. And you may be great at Nietzsche’s, but that’s because you’re comfortable there,” says Becker. But while she thanks those Tuesday open mics at Nietzsche’s for helping foster that talent, she can do so because she knows what it has produced. Some of her friends and protégés have broken into larger markets, carrying the Buffalo banner wide and far. Local comic Rick Matthews, who trained on Becker’s open-mic stage for years and won this year’s Buffalo Laugh Off award, now runs Tuesday nights at Nietzsche’s. It is soon to be renamed the Rust Belt Comedy Showcase. He values the bar’s stage as a place to prepare locals for bigger stages, here or elsewhere. A scene is just as much about place as it is momentum. Having a dedicated stage for comedy was essential to cracking through the industry’s most immediate ceiling. The call from Grossman, Helium’s owner, came at the right time. It’s a business, she understands, and though not corporate – Helium is family-owned, not franchised – it comes with the security of an established model. The club is well-appointed; stylish but not flashy. It feels, as some said on Facebook in days following its December soft opening, like an out-of-town club. This is important to more than the books, though. It means Buffalo’s Helium is poised to piggyback on to bookings with comics appearing at its Philadelphia and Portland rooms. It will build relationships with outside talent that will help import regional ticket sales and export local talent. What comes of these exchanges remains to be seen, but it’s already opened the door. “Right now, we’re getting a lot of Philly comedians, which is great because once our Buffalo comedians get their feet wet, they’re going to go to Philly. They’re going to go to Portland. We’re going to be in the Helium family, and we all play as a team,” says Becker. With doors now open, Becker is already onto the next stage of cultivation. Her goals now are bigger. Comically, ironically, it stands that Helium just may be Buffalo’s ticket out of town. “We went from having no horse in the race, to having a lead horse in the race,” says Becker.